Moulded in Polycarbonate, these autoclavable racks are made for holding 1.5 ml. Micro centrifuge tubes. These racks have a unique stacking feature which prevents movement in any direction. The holes are numbered & lettered for easy indentification. 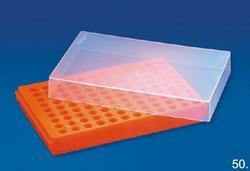 We are providing our esteemed clients, high quality Cool Cubes Microtubes. Our offered products are manufactured using high grade factor inputs, innovative machines and finest raw material by our reliable vendors. Apart from this, to meet the variegated demands of our clients, we offer entire range in several specifications. Efficient name in the industry involved in offering the optimum quality of MCT Twin Rack. Riding on profound volumes of business expertise, we are betrothed in providing an outstanding quality of Beta Micro Tube Rack. 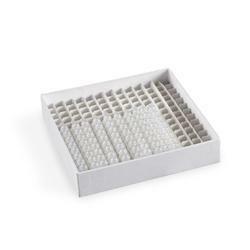 This autoclavable rack is ideal for sample processing and short or medium term storage of samples in a freezer. This rack can be stacked as well as coupled to other racks on all sides. Hence, ideal when both 1.5ml and 0.5ml tubes are being used, since racks of both sizes can also be coupled. These two-tier versatile racks, made of polypropylene, are autoclavable & can be used dry, in water baths or in freezers. These racks are provided with alpha numeric index for easy sample identification. Racks are stackable even when loaded and have purpose designed label spaces on each side. Screw cap, flip top, 0.2 ml, 0.5 ml, 1.5 ml... your choice. Moulded in Polycarbonate, this autoclavable rack is made for holding twenty four 1.5 ml. micro centrifuge tubes. This rack has a unique stacking feature which prevents movement in any direction. The holes are numbered & lettered for easy identification.